We offer a variety of different office workstation cubicles and furniture to accommodate your specific Chicago area office furniture needs and taste. 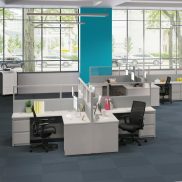 Whether you are looking for cubicles for a small office space or you are trying to put as many cubicles in a large room as possible, we offer several different types of cubicles to the businesses in the Chicago area. System 2 is our classic design that can be shipped within five business days. Abound was designed with expansion and flexibility in mind for the growing business. Initiate gives you that slight open-office feel while still giving you the privacy of a cubicle. 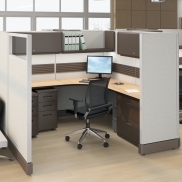 Accelerate was designed with variety in mind to let you choose the style of cubicle you want.